Peugeot lost the 2008 Le Mans 24 Hours. They went into the race as favourites with a considerable pace advantage over Audi and a band of top-line drivers recruited to end the German marque's dominance of the event. Instead, it was the underdogs that overhauled the Peugeots and added another chalk mark to their blackboard back in Ingolstadt. To say that Peugeot lost the race should take nothing away from Audi, who did everything they possible could have done to help their chances, and even then it came down to the last hour. The reality was that Audi needed to do everything flawlessly and still rely on a little bit of luck, but that's exactly what transpired. But hindsight is a wonderful thing and, on reflection, perhaps Peugeot weren't as strong as their cushion of between three and five seconds per lap helped them appear. Audi come out as the wise old hand that knew the secret all along but kept it quiet, going about their business and pinching the victory from under their rivals' collective nose. Firstly, Peugeot's quicker car. Yes, it was the fastest, and by a long way in qualifying. In race trim it slimmed to three to four seconds per lap, but even that was only with stable conditions. The momentum swung emphatically the other way as soon as it rained, and by a lot more than three seconds per lap. Peugeot can count themselves unlucky. If their cars had suffered all the same set backs but the race had remained dry throughout, they would have won. The disadvantage of a roofed car in the rain could not have been more clearly demonstrated, and Ricardo Zonta and Alex Wurz underlined the danger when both had to pit because they literally couldn't see where they were going. But the difference between the 908 and R10 in the wet didn't come down to just visibility. It also affected their ability to carve through traffic, allowing the Audis to circulate over 15 seconds per lap quicker at the height of the downpour. Secondly, the relative merits of the respective driver line-ups came to the fore over the course of the race. If you were to rate each driver's individual performance, you couldn't argue with the fact that Audi had their three greatest assets in the same car, and that won the race. While Peugeot's top three were spread across all three cars. The hope may have been to create a safety net for when the inevitable problems strike, ensuring that all three cars remain in the hunt - perhaps a slightly conservative approach that they believed they had enough of an advantage to allow. In reality, they could have done with Nicolas Minassian, Stephane Sarrazin and Franck Montagny in the same car. We'll never know whether that line-up would have won the same race - and Peugeot didn't want to risk all three being in the car that went out of contention with 22 hours still to go - but it just might have. The race was won and lost in the early hours of the morning when the rain came, and was at its heaviest. 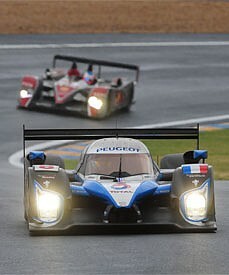 At 2am, Peugeot had a lead of three minutes. By 5am, they were nearly two minutes behind. And the lead 908, the No.7, didn't suffer any significant problems in that time, it just couldn't keep up on a slippery track. Once Audi's lead was in place, it was the outstanding performance of the trio in the No.2 car that kept it there. Peugeot never quite had a dry enough track to use its full potential to chase them down - every time a dry line started to emerge, another shower would arrive and spread a layer of grease on the asphalt - but they threw everything they had at the No.2 and nothing made it crack. 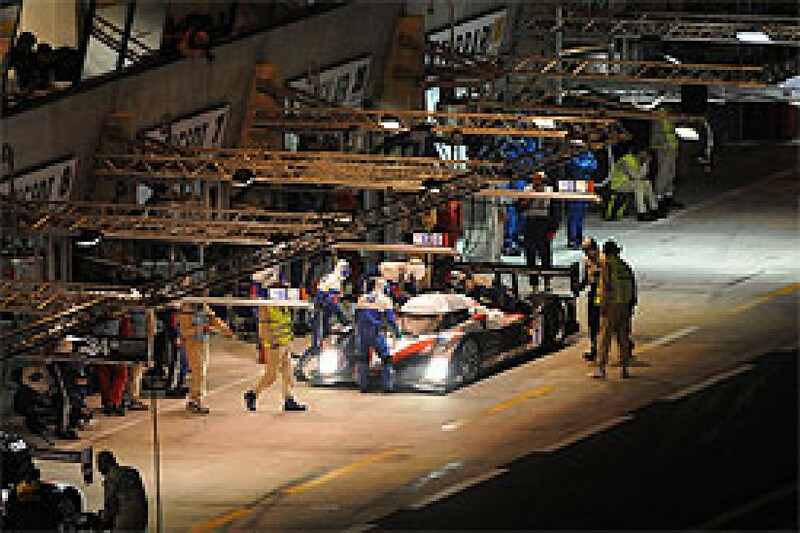 Audi are old enough hands at Le Mans to know how to play the game and they knew with three hours to go that all they had to do was keep their pace up and with no mistakes, the race would be theirs. You would have to go a long, long way to find a Le Mans line-up as good as this one, and you'd probably have to go a lot further to find three drivers that performed as well over the 24 hours. 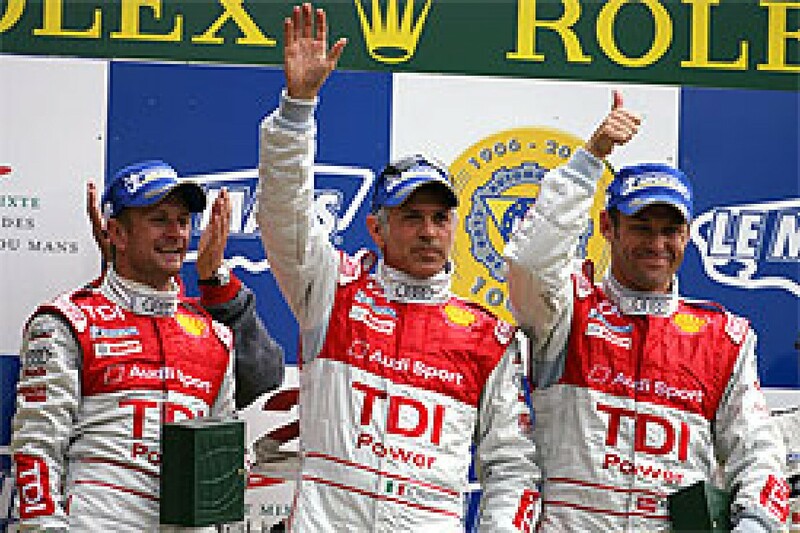 Allan McNish, Dindo Capello, and Tom Kristensen knew going into the race that they'd have to each have the drives of their lives to win and what each produced was truly special. Three of the best drivers in the world had to raise their games as high as they would go, and at the end they knew what they'd achieved and what it had taken. Tom Kristensen's stint in the early hours was the one that left Peugeot behind. His confidence and sheer ability in the wet broke French hearts all around La Sarthe as he stormed away from Marc Gene, lap after lap, after lap, until he'd built a lead that they could defend to the end. The record-breaking Dane's final stint was another to remember. He gave everyone a good scare when he clattered a back marker and spun, but recovered instantly and his ability to post the same lap times seemingly endlessly was the deciding factor. Peugeot knew they couldn't beat him without taking a huge risk, hence the decision to send Minassian out on slick tyres on a half wet circuit. But even though he was eight seconds a lap slower at times, Kristensen didn't flinch. Allan McNish put in some of the best work of his career as well. The very first stint of the race was as good as they come. As the Peugeots stormed away it would have been easy to slip out of reach straight away, but McNish left the other Audis far behind and kept the No.2 within striking distance, poised to capitalise when the opportunity arose later. But his second stint, as the sun came up on Sunday morning, was more impressive still. Conditions were improving and the Peugeots were coming back into play. The gap was down to 20 seconds at one point but McNish would not let Gene get any closer than that. Not only did he maintain the advantage at a time when the Peugeots should have been quicker, but he actually started to pull away towards the end of the stint. Because Kristensen and McNish happened to be on board at the moments when the race turned, you might overlook Capello's contributions, but his performances were right up there with his team-mates - crushing any queries that he might have seen his best days. He was unfortunate to be in the car twice when Peugeot were quicker and he was being chased down, but his ability to soak up the pressure and not attempt to take the car beyond the pace it could do proved vital. But it was the Italian that was pursuing, and catching, the No.7 car before the rain came and he took the car back into the lead. All three drivers were at their absolute best, and it was a real treat to see what happens when some of the best drivers in the world know that nothing other than their absolute best will give them a prayer of victory. No victory can have been more deserved by its crew than this. Minassian came into the race tipped as possibly the strongest of all the Peugeot drivers and he didn't disappoint. He could have done no more to improve the car's chances of victory. He pulled it into a big lead late on Saturday night and his spirited charge to the end of the race was edge of the seat stuff. He gave it everything as the minutes ticked away, throwing the 908 around on slicks, on a wet track, risking everything. He may have come off the road a couple of times, but it was at a point when the situation required those risks to be taken. Gene was strong and took the car almost where it needed to be, but in the end he couldn't quite carry it that extra step. He was keeping the car in the hunt on Sunday morning, but couldn't make enough of an impression on McNish to challenge for the lead again. Many would write Villeneuve off as the weak link in the team and it's true that he wasn't as quick as the others for much of the race, but he had his moments of brilliance. He was in the car when it rained and although he was losing chunks of time to Kristensen, he was the quickest Peugeot on the track for most of his stint. He could do little more than hang on to the 908 at times, but the car would have lost a lot more time in the first downpour were it not for his efforts. Franck Montagny was right up there with Capello as the unsung hero this year. The car wasn't really in the hunt for most of the race, but he was just so fast. He started the car and harassed Lamy all the way to the end of his stint. He got back in later on Saturday evening and was absolutely flying again. He reeled in Villeneuve and took the car into the lead for a while before handing it over. The car had fallen back by the time Montagny got in again on Sunday but he kept his pace up to repel the charge of the No.3 Audi to defend its podium finish. Zonta seemed to have the lion's share of the misfortune with the No.9 car. When he wasn't in the pits with problems he was did a solid rather than outstanding job, but kept it in the hunt for the podium. Klien was impressive in his first stint and had a good turn of pace as well, but he seemed to be brought down when he spun out of the lead and lost minutes, and was more reserved thereafter. He struggled to fight off the charge of Lucas Luhr early in the morning but later responded and was the fastest car on track for a while to secure third place for the car. An encouraging debut for the youngster. The junior car needed a good showing after the promise of last year and it got one. For the most part the car was smooth and consistent, not taking the risks that were its downfall last time, but each of the drivers showed their ability and justified Audi's decision to give them another go. Alex Premat and Lucas Luhr both had their moments and took the opportunities to press on when they arose, but it was Mike Rockenfeller - the villain last year - who was the standout performer. His charge in the rain in the early hours was something special. He was the fastest car on the circuit, even quicker than Kristensen, at a time when the pair were 10 seconds per lap faster than anyone else, and he brought the car back into the fight for third. The may never have been in the hunt for victory, but will have taken a lot of heart from out-performing the experienced No.1 car. If anything went wrong, it seemed to happen to the No.8 car. It was the quickest throughout most of the week, but its race was ruined by a gearbox problem just two hours in. Sarrazin remained among the quickest drivers throughout the race, and set a new record fastest lap in the 3:19s. Pedro Lamy and Alex Wurz were on exceptional form to bring the car back through the field after the gearbox problem struck while Sarrazin was leading strongly. Lamy just had the one mishap when he clouted the wall at Arnage and had to pit for repairs. The Frenchman got back in the car in time to bring it back into the top six, and all three kept plugging away to eventually take fifth from the No.1 Audi even after a battery problem cost it even more laps. A disappointing performance from the most experienced of the top six line-ups. The car did suffer its problems, but it was already a long way behind before the problems struck. It spent the first third of the race battling the No.3 car but fell back as the night came and simply wasn't as quick as the other cars for the majority of the race. Frank Biela took a while to get up to speed in the wet, but thereafter had a good stint where the car was back on the lead pace for a while and even threatened the No.9 Peugeot. But that only raised more questions as to why it wasn't quicker the rest of the time. The car was delayed by clutch problems but Biela and Marco Werner also had costly spins. Pirro was solid and gave good chase to the No.3 car at times, but on the whole it was a below par performance from the veterans.